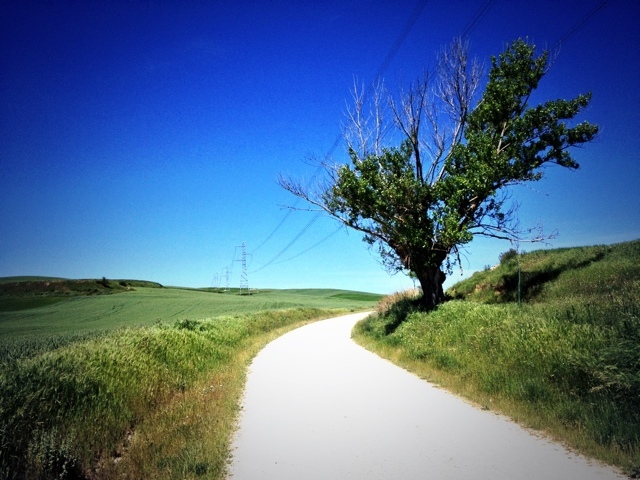 Today is the day I walked the dreaded Meseta. This is a tree-less plateau that covers most of the day's walking, meaning that the café stops become all the more important - you know that every seven kilometres or so there's a break from the brutal sunshine and a cold drink. Spain has a relatively still lemon liquid thing that comes in a can, and I've been drinking those since Lesley got me in to them. Very refreshing. Having left Burgos relatively early (and yes, it did seem rather expensive compared to the places I've been stopping at on the Camino in recent days) it was simply a case of plodding on in the heat as best as I could. I've discovered the trick to this is keeping an eye on the time - there's very little by way of landmarks to judge distance by in the Meseta, but I know that if I'm walking reasonably briskly I'll do five kilometres an hour. So when I passed San Bol at 3pm - five kilometres from Hontanas - I knew I'd be done within an hour. Sure enough, as I unshouldered my pack I heard the village's church bells strike 4pm. Hontanas is a lovely little village - located in a dip between the Meseta plateau, and a pilgrims' watering hole since the Middle Ages. 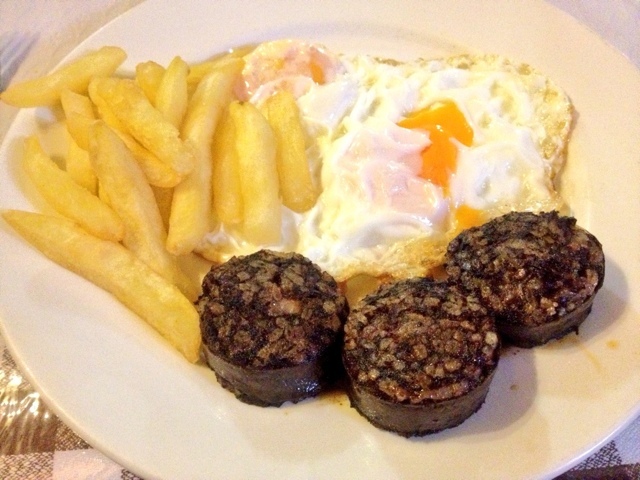 Supper was excellent, and was my first morcilla experience of the Camino. Ray - the Irish guy I've been walking with on and off since we started together in St. Jean Pied-de-Port - joined the lovely Irish girls I was with, and Gwendolyn stopped by for a drink when we'd finished. Ray also missed out on the municipal hostel in Burgos, and stayed in a monastery on the town's outskirts. It must have been a fairly strict religious order as they were cross when he was half an hour late for supper, and insisted that he joined them for an hour of prayer once he'd set the tables for breakfast! I'm writing this lying down on my silk sleeping bag liner in the very comfortable dormitory, and wondering when the Spanish men in the room will shut up. They're having some terribly long-winded conversation and the guy from Korea in the bunk beneath me is trying to get to sleep - and I'll be doing the same very shortly.